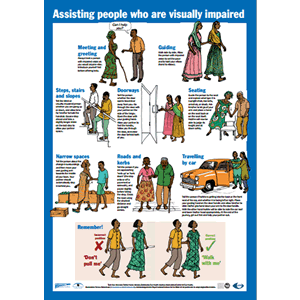 A3 size poster and illustrated guide to assisting blind and visually impaired people, covering: meeting and greeting, guiding, steps, stairs and slopes, doorways, seating, narrow spaces, roads and kerbs, and travelling by car. This poster was originally published in 2005. Authors: Text – Sue Stevens. Illustrations – Teresa Robertson. Acknowledgements – Royal National Institute for the Blind UK for permission to adapt original illustrations.